Pssst. You guys. Come here. Like, closer; I don't want to jinx anything. Because I think we've done it--I think we've finally gotten over the hump. Which is to say that winter might just be gone for good, and we're really, actually reveling in spring. At least, I hope we are, if not for my own sanity then for the life of the poor magnolia tree that bloomed in my neighbor's yard during the last week of March and then shivered to death during a two-day snowfall four days later. I was braced for a harsh winter this year, but I had forgotten all about the super charming Sybil quality of midwestern spring. But like I said--fingers crossed, here--I think we're in the clear. And now, if we get another blizzard the first week of May, you know who to blame. Anyway, with this week's wave of warmth and sunshine came a blunt-force craving for all things strawberry. It wasn't so long ago that I absolutely took for granted access to glorious California strawberries all year round, and I've pretty much pouted my way through months without them, because I refuse to pay five dollars for a thing of mostly white, hard, mealy ones in December. Blech. Strawberry snobbery aside, they're starting to show up in greater quantities (and at better prices) in grocery stores here lately, though we're still a couple months away from getting them at peak season, where they're juicy and red all the way through, and need absolutely nothing but a good rinse to make them fabulous. But I've decided to be all midwestern nice and sunny side-up about the current strawberry situation here, and declare that even early spring strawberries can serve a purpose. For starters, berries that are stretching to reach their peak are great for quartering and macerating in all kinds of delicious things to tenderize and sweeten them, and make them taste much more strawberry-ish. I love vanilla sugar, or orange blossom honey thinned with just a touch of hot water and a few drops of vanilla extract. Of course, a glug of booze, like kirsch, limoncello, or Grand Marnier, is always going to work juuuust fine. A short sit in any one of those, and you'll transform junior varsity-level strawberries in no time. You could also get extra fancy and roast them with some sugar and a squeeze of lemon or lime, if you're so inclined. There are ways to make the bridesmaid into a bride, is what I'm saying. So after bringing home two containers of early strawberries the other day, and realizing that maybe they were just a little too tart to eat straight up (although their gleaming ruby shoulders told a different story, those lying liars), I thought about giving them that aforementioned honey-vanilla treatment. But then I happened to be flipping through a gorgeous new cookbook and saw an awesome-looking recipe that had enough sweet elements involved to offset the tartness of the deceptive fruit, and even play nicely with it. If you've been paying enough attention to baking on the internet for any length of time, I'm sure you've come across the work of my friend and all-around awesome individual Shelly Jaronsky of Cookies and Cups. If butter, sugar, gorgeous photography, and a crazy good sense of humor is your bag, then Shelly is your girl. It's not everyday that you look through a cookbook and really get a snapshot of what it would be like to bake, eat, tell stories, and generally crack up with someone, and The Cookies and Cups Cookbook is just that. I've had the pleasure of "knowing" Shelly in that totally weird "we haven't seen each other's faces in person but yet I adore you and will be your personal cheerleader" Internet Friendship™ way for several years now. There's so much heart in this book, I can't even tell you. In fact, I got a little teary-eyed seeing how Totally Shelly this book is. She's good people. But beyond my love for the author, Shelly's book is one that's meant to celebrate the most crave-worthy comfort food around, and she shares it in a way that really simplifies recipes and makes it easy to get into it in the kitchen. It's a cheat day Bible, all buttercream and chocolate and buttery, crisp edges, with plenty of savory options, too, for days when no cheesy carb should be left behind. 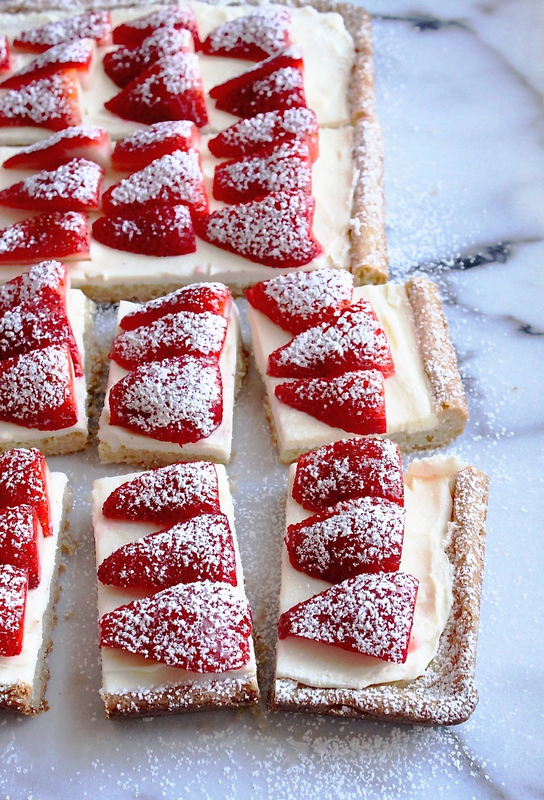 These Strawberries and Cream Bars are a great example of what Shelly's book is all about: they're easy to make and lovely to look at, use totally basic ingredients but combine them in a way that you might not have expected, and definitely a little over-the-top, but worth every dang calorie. The only note I'd make about this recipe is to watch your baking time on the crust--the original recipe reads 30 minutes, but I noticed mine getting golden much more quickly, pulled the pan from the oven around 24 minutes, and got a firm, almost crunchy crust. This was not necessarily a bad thing, and of course all ovens vary. However, I would have loved the crust to be just a little more tender, so next time I'll do 18 to 20 minutes max, just to make the base softer. For the cream layer, make sure your cream cheese is completely room temperature for the smoothest cream layer. On a related note, I like to melt white chocolate over a double boiler or on the defrost setting of the microwave in 30 to 40-second bursts, to keep it from scorching. Shelly uses salted butter in her book, so the original recipe doesn't call for salt. I'm an unsalted kind of lady, so I added about 1/2 teaspoon of fine sea salt. Position a rack to the center of the oven and preheat the oven to 350°F. Spray an 11-by-7-inch baking pan with nonstick cooking spray, and line it with parchment paper or aluminum foil. In the bowl of an electric mixer fitted with the paddle attachment, beat together the butter, sugar, and vanilla extract on medium speed for 2 minutes. Reduce the speed to low and gradually stir in the flour. Press the dough evenly into the prepared pan. Bake until the edges of the crust are just beginning to turn golden, anywhere from 20 to 30 minutes (do not overbake). Let cool completely in the pan set on a wire rack. 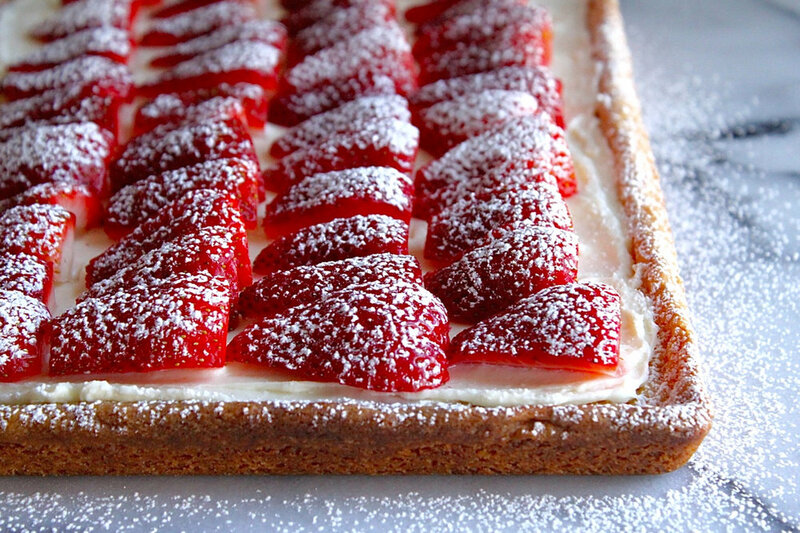 To make the topping, in the bowl of an electric mixer fitted with the paddle attachment, beat the cream cheese on medium speed until perfectly smooth and creamy. Add the melted white chocolate, and continue to mix until evenly mixed. Spread evenly over the cooled crust. Refrigerate for 30 minutes. When you're ready to serve the bars, arrange the berries artfully over the cream layer, and cut into 16 bars. Refrigerate any leftover for up to 2 days.